The Center for Latin American and Caribbean Studies serves KU and the Lawrence community by organizing events and programs throughout the academic year. We work in partnership with other organizations around campus, such as the Hall Center, The Commons, the Department of Spanish and Portuguese, the Center for East Asian Studies, the Institute of Haitian Studies, the Kansas African Studies Center, the Latin American Graduate Student Organization, and many others to provide programing that showcases the vibrancy, diversity, and complexity of Latin American and Caribbean culture and language. Our popular event series include Charla de Merienda, in partnership with Lawrence Talks and The Commons, Coffee and Tea Talk, in partnership with the Center for East Asian Studies and the Kansas African Studies Center, and the yearly Global Opportunities Expo, in partnership with Donnelly College. 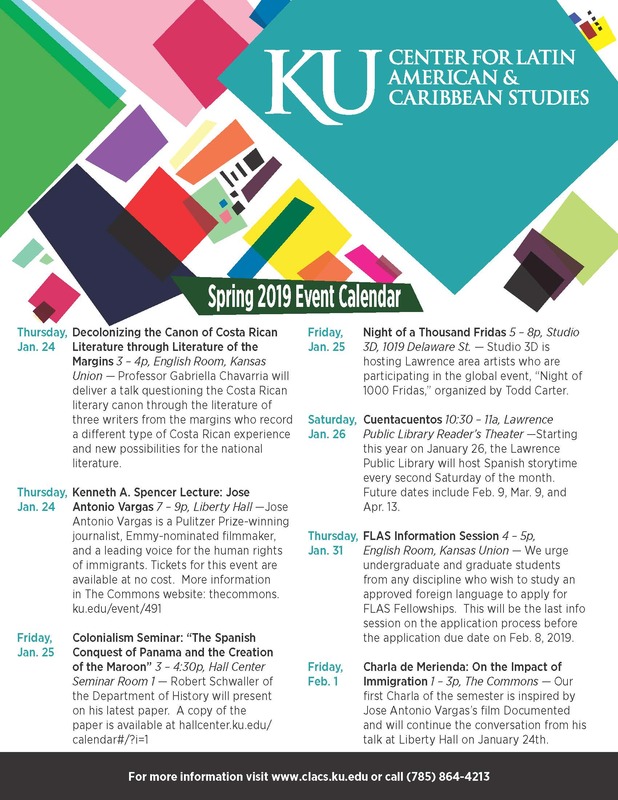 Download a PDF of our Spring 2019 Events Calendar (at right) to learn of events throughout KU and Lawrence that center on Latin American and Caribbean issues.